I was really excited to try Smile Brilliant being a former Dental Assistant I am very funny about whitening that is done off websites or over the counter whitening. Smile Brilliant actually has a couple of methods you can try for their whitening. They have the custom fitted trays or they have the trays you can form yourself with the plastic mold trays you get in the mail. I received the ones you can form to your mouth you have a choice you can boil them and form them to your teeth kind of like a mouth guard or you can leave them plain. I choose not to boil mine. Which I would suggest you boiling them. Me working in the Dental field I should of known to do that but I choose not too. But regardless the most effective way to whitening would be to have custom trays made and that system they do have. So besides the trays moving around some. I do love this product. What do I love about it?? I love the whitening gel and the uv light the kit comes with. The uv light is just like the light we use in the dental office so I was a little afraid of burning the gums because in the office we use two by twos aka cotton to keep the mouth dry. But to my surprise their was no burning at all on the gum tissue. I whitened my teeth for a total of 20 min over 4 days. Now keep in mind I haven't whitened my teeth in 3 + years but my teeth were still pretty white I thought. I do drink coffee and soda on occasion though. Here are the photo's below. SmileBrilliant! is a national dental lab designed to help our customers receive professional strength teeth whitening without ever visiting a dentist! Our lab was specifically created to curb the high cost of cosmetic teeth whitening that is charged at dental offices around the world. Remember I use to be a Dental Assistant so my teeth were kinda on the white side anyway. But to me they look yellow. And I haven't whitened in years. 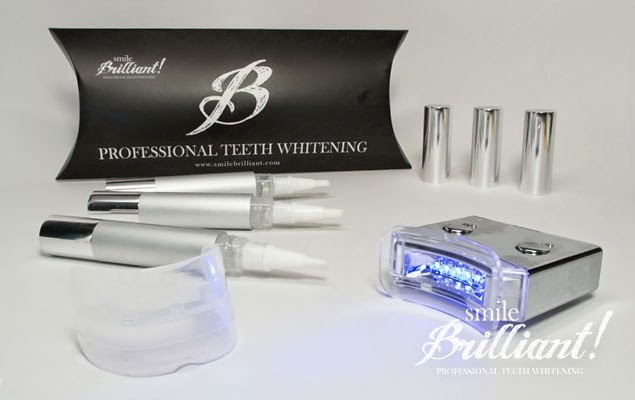 Would you like to win a Smile Brilliant Kit of your own?? Enter the Rafflecopter Below for your chance to win!!! I've definitely considered it, but have never actually tried it before. I've considered it and I know my boyfriend plans to do it once he gets a new job. I have tried a couple of products but couldn't tell much difference! I've considered it, but concerned if it is safe for sensitive teeth like I have. I have not tried a teeth whitening product. I should but they are expensive. I love trying new whitening products! I haven't found the perfect one yet, but I'm still looking. I've tried crest white strips and I've tried one similar to this. The one I had like this did not wow me as much as I had hoped.... Esp for the price tag! I have been considering whitening my teeth ever since my brother tried Crest white strips. I've tried the strips but only half heartedly. I'd like to do it for real. I have tried the crest white strips, but Ive never done anything heavy duty like this. I have considered it... But haven't purchased anything to do it. I've tried several different at home whitening treatments and every whitening toothpaste there is but have never noticed much of a difference. I have used Crest Whitestrips, but never gotten it done professionally. I have been wanting to try the Smile Brilliant! I have used whitestrips but nothing stronger. I've used the whitening strips before! I have and would love to whiten! I have not but i am very interest in trying it now. Ive done the crest white strips. I have not tried it but definitely have considered it!